• For quantitative determination of uric acid and evaluation of drug effects on uric acid metabolism. • Uric acid is the waste product produced from the degradation of purines. In healthy human, uric acid is filtered and removed from the blood by the kidneys and excreted into urine. Because a number of kidney diseases are known to affect uric acid levels, uric acid determination is thus important and useful in diagnosing and evaluating kidney diseases. For example, when uric acid is present in the blood at abnormally high levels, it tends to crystallize in body joints, resulting in gout, a very painful inflammatory condition. Increased levels of uric acid are also known to be associated with uremia, leukemia and pneumonia. Simple, direct and automation-ready procedures for measuring uric acid concentration in blood are becoming popular in Research and Drug Discovery. BioAssay Systems uric acid assay kit is designed to measure uric acid directly in serum without any pretreatment. The improved method utilizes 2,4,6-tripyridyl-s-triazine that forms a blue colored complex specifically with iron in the presence of uric acid. The intensity of the color, measured at 590nm, is directly proportional to the uric acid concentration in the serum. The optimized formulation substantially reduces interference by substances in the raw samples. 1. What is the principle of the assay? The assay is based on the quantitative reduction of Fe(III) to Fe(II) by uric acid . Fe(II) reacts with 2,4,6 - tripyridyl-s-triazine to form a colored complex which is measured colorimetrically. The color intensity is directly proportionate to the uric acid concentration. 2. How specific is the assay? The assay is not specific for uric acid, but will also detect other reducing substances (antioxidants), such as ascorbic acid. In human serum and urine samples uric acid is the predominant antioxidant. Most mammals, except for great apes, produce the enzyme urate oxidase, and serum uric acid levels are much lower (about 1/5th of human serum levels). 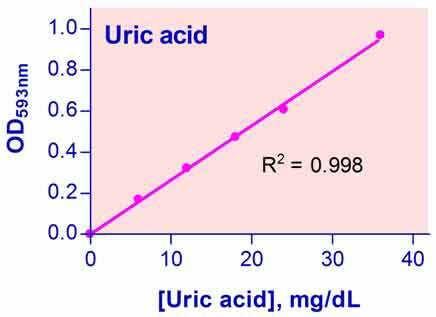 In those serum samples the assay may overestimate the actual uric acid concentration. 3. Can I use this kit to determine uric acid levels in cow manure? Yes. You can extract uric acid with 7 mM glycine buffer, pH 9.5 containing 5% glycerol. Simply mix preweighed manure and known amount of buffer together, homogenize in a tissue homogenizer or shake to dissolve all solid materials. Filtrate or centrifuge to obtain clear extract.